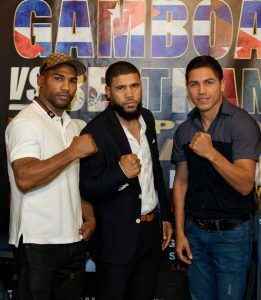 In the “REDEMPTION IN MIAMI” main event, former four-time world champion in three weight divisions and Olympic Gold Medalist YURIORKIS “El Ciclon De Guantánamo” GAMBOA will battle two-time world title challenger MIGUEL “Barreterito” BELTRAN, JR. in a ten round lightweight bout. In the co-feature, former three-time world champion in two weight classes JUAN “JuanMa” LOPEZ will clash with CRISTIAN RUBEN “Piedrita” MINO, also in a ten-round lightweight bout. “Redemption in Miami” will take place Saturday, November 10 at Marlins Park on the West Plaza in Miami, Florida and will be available live on pay per view, distributed by Integrated Sports Media, beginning at 9 pm ET / 6pm PT at a retail price of $24.95. “Redemption in Miami” is promoted by New Champions Promotions in association with Marlins Park. Ticket prices start at $60 and will go on sale Wednesday, September 26 at 10:00 am ET and be available at the Marlins Park ticket office and on line at www.marlins.com/boxing. Fight night doors will open at 6:00 pm and first bout will begin at 7:00 pm. Thank you again for coming and I am happy to be on the big stage again, one that I have been used to being on. This is a pay per view event and that merits a lot of attention. With the help of my management team including Mr. Pepiama who has taken the spot of my promoter and has helped me very much and become almost a father figure to me. I thank New Champion Promotions for giving me this opportunity and I look forward to it. Obviously most important to me personally is to win this fight and potentially set up the next fight against Yuriorkis Gamboa, which has been a fight that has kind of eluded both of us but as long as I take care of business and he takes care of business there is no reason for that not to happen for the next fight. On the other hand he is talking about fighting Lomachenko. If he wins this fight and skips me and wants to keep running, let him run, but hopefully he does not run. This fight was done with the idea and the plan that we both get featured on a card and we fight and win and fight each other but now he’s talking a different language – fighting Lomachenko – so maybe he is having second thoughts. It’s a fight that the public wants but it is all up to him. Hopefully he sticks to the plan. I am very happy to be here. This is my first time I Miami. 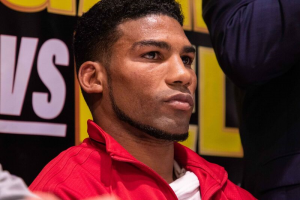 I respect the community, I respect all of the Cubans here in Miami and I respect all the press here in Miami and I respect Gamboa but I came here to fight and I came here to win so let’s get to it. I will be 100% training for the fight. I came here to win and I will give everything in the ring to make that happen and that’s the way it’s going to be. I will be the one winning that night. I am very appreciative of everyone here and than you very much. I would like to thank everyone that is here supporting this event. This is something that has been a long time coming. It is something that I have promised to my fans in Miami, which is the city that has really embraced me when I first got here from Cuba. I would like to thank Jesse Rodriguez for believing in me and not only me but believing in Miami to make this a reality. There have been a lot of things that have happened in my career and my career is far from over. I am here to be the best, which is what I have always felt I am. With the right people around me I am looking forward to having a great fight on November 10th and not only a great fight, but a great event in and of itself. The comment that JuanMa had made earlier that I may be running or I may be ducking – that is false. He knows he is contractually obligated to New Champions for two fights – the second fight would be, if we both win, a fight between me and him. The fact that my goal is to fight Lomachenko or someone else in the division does no mean that I am trying to duck him. By all means I know my obligation and I know his obligation. My obligations right now it to win on November 10. After winning November 10, I want JuanMa. Very important to note is that the effort that New Champion Promotions is making in not only hosting the event but making the commitment to the city to bring this caliber of an event to Miami and South Florida. Both he and I and the company itself hope to continue to host thee type of events not only in the near future but long term as well. With respect to my fight in and of itself I would like to welcome the city of Miami, not just my fans, to come and embrace this event on November 10 – it’s going to be a great event. In respect to the comments made by my opponent on November 10, Mr. Beltran, I understand the challenge that he poses but I don’t see him as too much of an obstacle towards the goals that I have set for myself – in the near future is JuanMa and then after JuanMa, going up against Lomachenko. Those are my objectives and I want to share this ride with Miami and that’s what I am doing coming into this new arrangement with New Champion Promotions and making it a must to do the PPV here in Miami because I know the people of Miami are going to support it.